Back in the day, my dad had a certain supper specialty he'd lovingly whip up for me, my sister, and my mom. 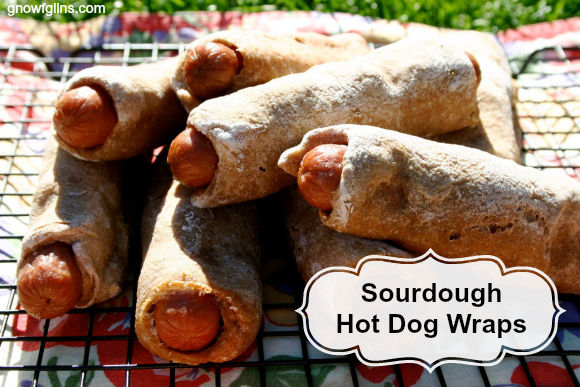 Hot dogs wrapped in a certain store bought crescent dough. Is anyone else out there nodding their head, sharing a similar memory? Classic, right?! Well, this recipe is my nod to those sweet memories, as well as to the satisfying smiles that come from an even tastier and healthier sourdough version. This recipe freezes beautifully (before or after cooking), reheats like a champion (or is delicious cold), and can be doubled, tripled, you name it! We've enjoyed these wraps straight from the fridge for an easy, no-mess, nourishing meal/snack on a walk, at the camp ground, in the car. Mmm, delish. Check out “Take Note” below the recipe for adaptations and tweaks. Makes: enough dough to cover at least 8 hot dogs. In a medium size bowl, stir together the sourdough starter, milk, and whole grain flour. Add more flour until you have a THICK dough. Knead the dough together for just a couple of minutes. If it's too sticky, add more flour. Keep in mind, this dough will be souring for at least 6 hours and you will need to roll it out after adding the sea salt and baking soda. Cover the bowl with a towel and a plate and set aside on the counter to sour for 6 to 8 hours. After the souring time is complete, sprinkle the sea salt, baking soda, and any additional herbs on top of the dough. Take a wooden spoon and jab the new ingredients into the dough and then use the spoon to turn the dough out onto your counter. Knead the dough for a few minutes or until you feel the additional ingredients have been completely worked through. Preheat the oven to 350 degrees Fahrenheit. Grease or lay parchment paper on a cookie sheet. Generously flour the work surface. Roll out the dough adding more flour as necessary to prevent sticking. Now, begin making the pockets/wraps. Here's what I do, but please use the method that works best for you. After spreading and sprinkling the dough with our tasty dijon and some favorite hard cheese, I pick up a hot dog (Applegate Farms organic recommended) and hold it up to the dough. Using a pizza cutter, I cut the dough to the width that will work for my hot dogs all the way down the length of the dough. (I make the dough width according to whether I want to tuck in the ends or leave them exposed.) Then, I place a hot dog on the edge of the dough and begin rolling. Once I’ve gone around once, I use my pizza cutter to make the final cut at that point. Finally, I seal it up well and place the wrap on the cookie sheet. I repeat this process to cover all the hot dogs. With leftover dough, I enjoy creating treats like mini braided bread sticks and pesto cheese spirals. Such fun! Bake at 350 degrees for 15 to 20 minutes. Check at about 10 minutes to see how things are coming along. Remove from oven and serve. Enjoy hot or cold and don't forget your favorite dips. Here are a few to get you started! Oh, the flexibility! Imagine with me for a moment… Leftover Ham/Turkey and Cheese, Sausage/Bacon, Egg, and Cheese, Pizza Pockets, and Taco pockets. 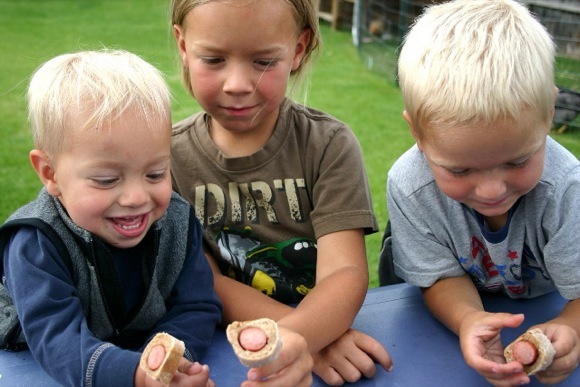 How about adding a stick to your hot dog wrap to make it like a corn dog! Certain fillers will require you to seal the dough at the ends, too. I've made cheese wraps with insufficiently sealed dough, and all the cheese oozed out onto the cookie sheet. Delicious, but not what I had in mind. Leftover bits of dough make tasty mini bites of goodness, but you could always combine scraps and reroll. Wraps with thicker dough will need to cook longer than wraps made with a thinner dough. I often double the recipe and make a batch of sourdough english muffins on the griddle while my wraps are baking in the oven. Delicious in school lunches, off-to-work lunches, and we-do-school-at-home lunches. In fact, I look forward to using this sourdough recipe as one of our cooking lessons! 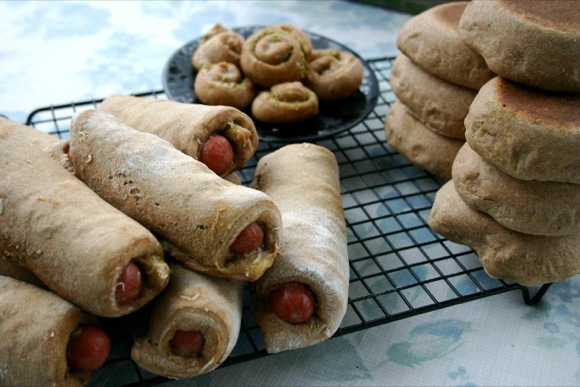 It's Labor Day and if you get your dough started this morning, you can be enjoying these for dinner! Otherwise, make them soon and be sure to let me know what you think. This post was featured in 60 Easy & Nourishing Picnic Recipes and 92 Nourishing Grill & Barbecue Dishes, Drinks, & Desserts. Erin writes from Anchorage, Alaska where she savors a slow-paced and simple lifestyle with her husband and three young boys. Family birding adventures, hiking in the mountains, camping in their VW bus, and the warmth of the springtime sun bring them many smiles. Their greatest joy, however, comes from living for Jesus and seeing His goodness and care in the big and little moments of each new day. where is the recipe for the sour dough starter??? 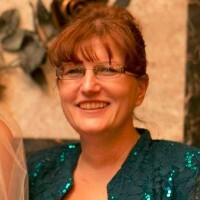 Erin, I do believe you are the “sourdough queen”! What a wonderful treat you have made for your family. I can’t wait to try these! Thanks for sharing! Greetings from PA! Awwww! Thanks Karen. 🙂 You are most welcome. Such fun sharing sourdough treats! Enjoy your Labor Day! I am making these for dinner tonight! We can’t wait! I made your ketchup and mixed it 1/2 and 1/2 with sour cream for the dipping sauce. We stuffed the wraps with cheese and Applegate hot dogs. I closed the ends like you said to prevent cheese oozing out. Wonderful! Thanks for the smile this morning Wardeh. 🙂 I’m so glad you all enjoyed the wraps. Aren’t they fun! I had such fun thinking of you and your family giving them a try last night. And I love your dip idea. We’ll definitely be giving that a try! Can these wraps be made and baked in advance and then wrapped around the filling? Hi Scott- Hmmm. Let’s see… You could always make the english muffins and shape the dough to suit your brat. Once the english muffin is somewhat cooled, slice it and use that as a bun. Or… I bet it would work for you to roll out the hotdog wrap dough onto a prepared cookie sheet (the thickness you’d like it), bake it (maybe at 350 degrees F for 15 minutes? depends on the thickness of the dough), and then (after letting it cool for just a few minutes) cut the “wrap” into the shape you want (a pizza cutter would work well) and begin rolling up your just-cooked-brats. That might work! If you give this idea a try, be sure to let me know! Hi Erin, I have a sourdough question. I made my starter from instructions on your very good:) video. It started out really well and bubbled away for the first couple of days. I fed it morning and evening and then started pouring some off as instructed. This is where something went wrong. It just sort of quit bubbling! when I take off the coffee filter an look into the jar I see bubbles but from the side of the jar…nothing. can you tell me what to do now? Will the recipe work if the salt is added before the soak? I goofed. And Thanks for your great recipes! Hi Tatiana~ Not a problem. It’ll still work. Enjoy! Can you give me instructions for freezing the cooked hot dog wraps and then reheating? Thanks!